IS THE Norwich Terrier RIGHT FOR YOU? Norwich Terriers are a hearty companion dog. Despite being one of the smallest terriers, the Norwich has a lot of energy and a big appetite. Norwich Terriers are quick to make friends. A cross-breed of small Irish Terriers and other short-legged terrier breeds, the Norwich Terrier originated back in the 1800s in East Anglia, United Kingdom. Smallest in the group of working terriers, The Norwich Terrier is used for hunting and as a fun-loving family pet. The smallest of the working terriers, the Norwich Terrier has a short, muscular, compact body with sturdy legs. Their medium length tail is usually docked so as to stand up straight. They have a wiry coat that is about two inches long. 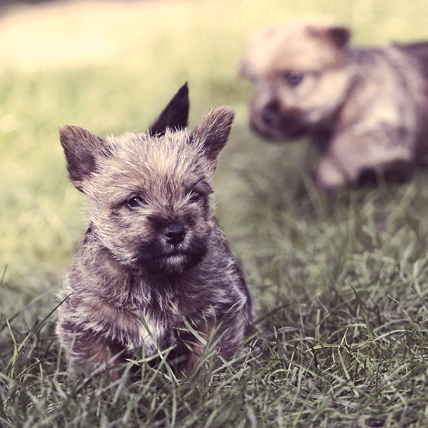 Their ears, unlike the Norfolk Terrier, are pointed and stand up atop their wide, round head. The Norwich Terrier comes in red (all shades), black and tan, and gray. White marks are considered unacceptable by the AKC breed standard.